Families shouldn't be scraping by with the bare minimum ... wage – at least if you ask the YWCA of St. Thomas-Elgin. From Oct. 30 to Nov. 6, communities coast to coast will be marking National Living Wage Week – and once again the local agency is getting on board. “We're hoping the community is getting a good understanding and that 'living wage' is becoming common language,” said Lindsay Rice, director of community programming at the YWCA. Read the full story at the St. Thomas Times Journal here. More than a blue-sky concept in Guelph, the practice of a living wage has been embraced by a number of local employers over the past year, including a national firm based here. Next Tuesday, as part of Living Wage Week, those Guelph and Wellington “Living Wage Employers” will be recognized for their commitment to pay a living wage. The Guelph and Wellington Task Force for Poverty Elimination started the recognition program one year ago. In this area, that living wage has been determined to be $16.50 per hour, the conservative estimate calculated by the Poverty Task Force with the support of the Canadian Centre for Policy Alternatives. Read the full story at Guelph Today. Josie Rudderham and Nicole Miller have big dreams for the small business they started five years ago in a house in Hamilton, Ont. The owners of Cake & Loaf Bakery Ltd. – a million-dollar business that bakes goods from scratch using local ingredients – want to expand their main location to include eat-in and meeting spaces for baking classes and community events. They also want to build a customer relationship management program that can help them maintain the personal touch that’s become a key part of their brand. It’ll take a lot of cash – at least $150,000 for the space expansion alone – to turn this wish list into reality. But there’s no stopping Ms. Rudderham and Ms. Miller now; the business partners and former college classmates have won this year’s Small Business Challenge contest, sponsored by The Globe and Mail and Telus Corp., beating out more than 3,300 entries. Read the full story at the Globe & Mail here. London Mayor Matt Brown is encouraging private businesses in the Forest City to pay employees a living a wage. He's just supportive of the city demanding the same of at least one of its contractors. 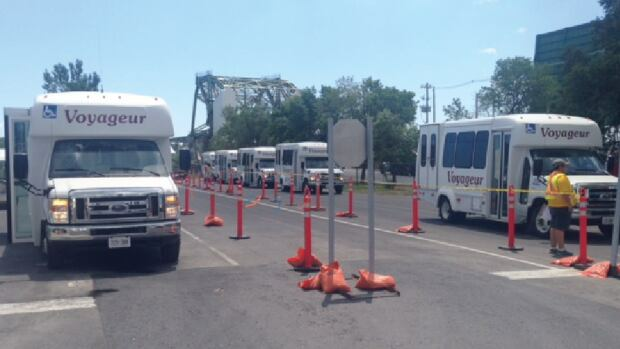 Paratransit drivers in London say they want the city's leadership to step up and really take action to end poverty by practising what it preaches and force their employer, Voyageur Transportation Services, which contracted by the city, to pay a living wage. The Voyageur drivers are upset about the fact they make slightly more than minimum wage while the mayor is promoting a living wage of $15.50 per hour. Muskoka Brewery becomes the first brewery in Canada to adopt a living wage for its employees. The recent PSPC's living wage report found that the living wage for Peterborough is $17.65 per hour. This is the amount each of two adults living together with two dependent children must earn. This amount is higher than the living wage calculated in 2012 which was $16.47. If you live in London, you need to a make $15.53 an hour or $30,284 a year to meet your basic needs, according to a “living wage” report released Friday by a coalition of businesses and private agencies. Read the London Free Press story here. The so-called ‘living wage’ for Niagara families to realistically be able to pay their bills has been pegged at $17.47 by the Niagara Poverty Reduction Network. Read the full story at Niagara This Week here. In a new issue of Alternate Routes: A Journal of Social Research, Charity-Ann Hannan, Harald Bauder, and John Shields write about living wage campaigns and their effect on "illigalized" migrant workers, and what can be done to improve their working and living conditions. Read the full article from "Alternate Routes" a journal of critical social research. Living Wage Waterloo reflects on a year of working towards living wages in the region.